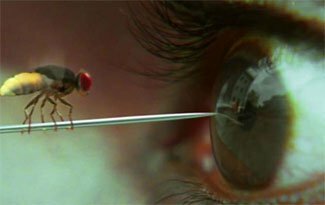 In Makkhi, the Hindi dubbed version of the blockbuster Telugu film Eega, a man is reborn as a housefly so he can avenge his own death. Few films are as wildly imaginative and as consistently entertaining as this one from director SS Rajamouli, who takes popular reincarnation sagas like Karan Arjun and Karz, and turns them on their heads. Makkhi begins as inventively as the rest of the film unfolds – with a blank screen accompanied by the voiceover of a father (Ajay Devgan) narrating a bedtime story to his daughter. “Once upon a time, there was a fly,” he begins, kicking off the story of our protagonist Jaani (Naani) a man ardently in love with his colleague Bindu (Samantha Ruth Prabhu). Yet it all goes horribly wrong when a lustful business tycoon Sudeep sets his eyes on Bindu. When Jaani is murdered, his soul comes reincarnated in a fly to take revenge on Sudeep, and to protect his love. With large opaque eyes, Jaani the housefly doesn’t have the facial expressions that you would see in animated films like A Bug’s Life, but Rajamouli invests so much personality in the insect by making use of his little body and spindly limbs. Makkhi has a superhero, comic book quality; you watch half-incredulously, half-amused as this persistent fly drives Sudeep insane. The fly becomes a character you root for, and incredibly, you can see characteristics of Jaani the human in the tiny bug. The animation in Makkhi is unfussy, but this is a great example of how the idea is truly the star. Kannada actor Sudeep plays his part of the cold-hearted villain with true comic book flair and even a cartoonish tinge. It is because he is a powerful antagonist that you relish the face-off between the fly and him. Even if the film gets a tad repetitive towards the climax, it ends up a unique cinematic experience. I’m going with four out of five for SS Rajamouli’s Makkhi. Make sure you don’t miss it; it’s the most fun you’ll have had at the cinema in a long time! i waited so much for this review .. u didn’t let me down … though i expected little more analysis on this film. Nice review sir.. I never expected 4 stars for a remake of a Telugu film. I could see fresh story-telling capability in the film, But now I realise how an original inventive idea, insanely incredible imagination would draw such a huge resonance across the country. Super happy for Director S S Rajamouli & Sudeep. Yesterday i saw the Movie & i feel this has set a new bench mark in Indian Cinema..
Good review… SS Rajamouli. super director of Indian Film Screen! I agree that movie is Good. But not to the rating of 4/5. The story is good upto some extent and later on the story slows down and boring. Idea innovative but story telling not upto the mark. People who think this movie lack story or has many mistake seriously must stop watching movies.THIS IS AN AWESOME MOVIE. MUST WATCH.DIRECTOR DESERVES TO BE PART OF 100 CR. CLUB. Rajeev’s analysis is so damn right. plz explain which part of the movie was that much good for which you give 4/5. I agree with biman,4 stars r 2much…….3 is enough…. sir this movie does not deserve a 4 star….3 or 2 and a half were enough…this is too much..seriously did u like the film or for just encouraging new works you gave a 4 star…??? deserves 4/5 coz the movie is something tried in its first kind on indian cinema.wish we get more cg live action movies. @santosh, since when “learning eglish” is mandatory in order to comment? Everyone is entitled to his/her own opinion. First Time ever Unbiased Review for a Movie Directed by a South Indian…..The movie is such that he could never give less stars. Movie Surely Deserves 4! Good Review as usual Rajeev Masand Ji!! Excellent movie, worth giving 4 stars! redefines how the movies should be made use of technology.